This weekend, I had a hankering for fudge but not any fudge, I was reminiscing on the good times when my family and I would travel down south to Candy Cow in Cowramup located in the South West. To satisfy my sweet tooth craving I decided to create another dessert combination, Cotton Candy and Fudge AKA – My happy place. Spray a 20 centimeters pan with non stick cooking spray and line with baking paper. In a microwave safe bowl heat your white chocolate chips and sweetened condensed milk for 1 minute on high. Add your cotton candy flavour mix or a few drops of food colouring then give it a good stir and heat for a further 30 second if needed. Keep heating at 30 second increments until the mixture is smooth. Pour the fudge into your prepared pan then rrefrigerate for 2 hours until set. 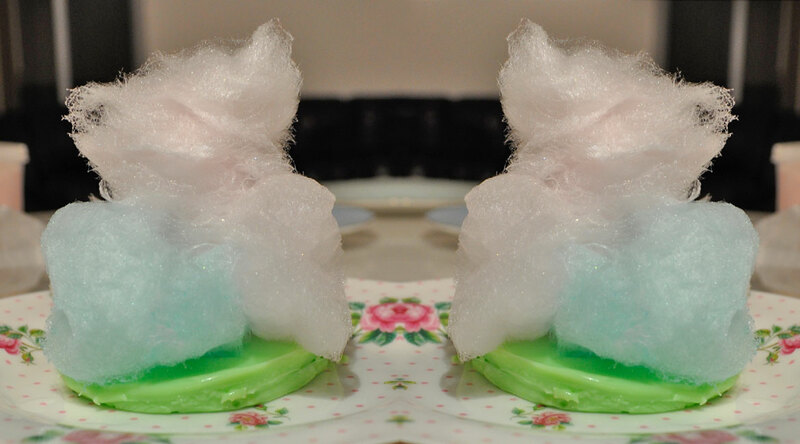 Cut into desired shape and garnish with bits of cotton candy. Lining the pan with baking paper makes it easy to lift out and cut on a chopping board rather than in the pan.